Best Historical Novel nominee for 2015. PIONEER AWARD, 2012: for authors who have been writing since the 90's. Best Historical Novel nominee for 1999. Career Achievement Award nominee for 1998. "Historical Storyteller of the Year" nominee for 1997. 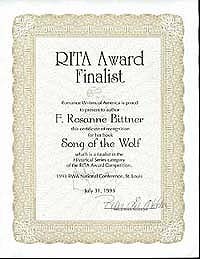 I am excited and pleased to announce that I am the winner of the 2011 Mid-Michigan RWA Angel Award, "for devoted service and inspiration to other writers!" Though all of my awards are special to me, this is a very special honor, voted on and presented by my fellow MMRWA members. WHERE HEAVEN BEGINS, WINNER of the prestigious 2005 WILLA Award, given annually for outstanding literature featuring women's stories set in the West. 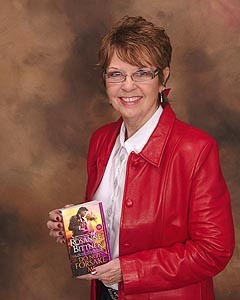 Finalist, Favorite Author Award 2000, along with such famous names as Nora Roberts! 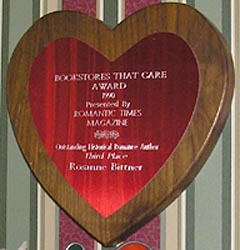 This award is voted on by readers, not by the magazine. for continued popularity and for quality, excellence of writing, and entertainment given to readers. Nominated for awards in Arts & Communications and in Community Service "for accomplishments that have had an impact on the community." I didn't bring home the plaques, but I was a winner--because my son, Brian, nominated me! Distinguished Woman Award presented by the City of Coloma, MI (my hometown) for "bringing honor and distinction to the Coloma Community and to the women and men of America through your literary accomplishments. Your scores of novels inspire all who read of the adventures and historical settings your gift of the written word empowers you to so creatively express." All other photos this page Copyright © 2000 by Pat Crean, Flying Spots Photography. All Rights Reserved.